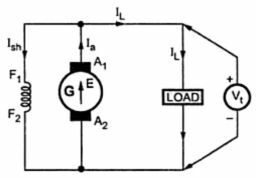 When the field winding is connected in parallel with the armature and the combination across the load then the generator is called shunt generator. The field winding has large number of turns of thin wire so it has high resistance. Let Rsh be the resistance of the field winding. Now voltage across load is Vt which is same across field winding as both are in parallel with each other. While induced e.m.f. E, still requires to supply voltage drop Ia Ra and brush contact drop. In practical, brush contact drop can be neglected.